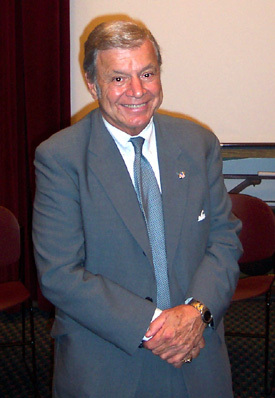 Gotham Gazette: Our guest today is former City Council Speaker Peter Vallone, who headed the council through the administrations of Ed Koch, David Dinkins, and Rudolph Giuliani. 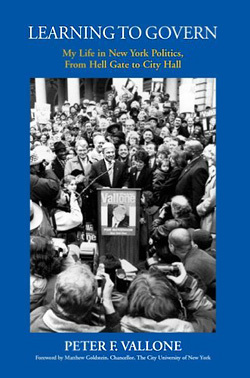 Mr. Vallone, you have recently written a book about your experiences in New York City government, entitled Learning to Govern. What inspired you to write this book and why did you decide to do it now? Peter Vallone: Based upon my years in office, it became very clear to me that very few people know anything about government. The American system of government, in my opinion, is the greatest system of government ever devised by anybody. [What has happened since 9/11], I think, makes it essential that we go back to learn about our government. I also wanted to let readers know that what they read and see on television is not a true story about what goes on in government. The only way to make money in media is to talk about what goes wrong in life and in government. So, if you pick up today's newspapers or look at the television, they'll be talking about murders, they'll be talking about some government official somewhere who was indicted, but they won't be talking about the nuts and bolts of government, and all the things that are going right in government. [Another thing I wanted to address is] that the balance of government is tipping in favor of an all-powerful executive at the expense of the legislative branch. Since so many people know someone in office that they don't like, eight of 10 people are now in favor of term limits for the legislative branch of government. This is a disaster for our legislature because it can never be equal to a mayor, a governor, or a president without some kind of seniority. Gotham Gazette: The council is currently working toward choosing its next speaker. At a recent forum among candidates for speaker, each speaker said they supported the idea of the council extending term limits from 8 years to 12 years. Do you agree with that? Peter Vallone: Yes, it's a small step in the right direction. At least 12 years gives you some natural staggering where not everyone will be leaving at the same time. The term limit movement started because a billionaire who ran against Guiliani spent $14 million, but only got 14,000 votes in the Republican primary, and got so annoyed that he decided to institute term limits throughout the whole country. But he couldn't do it in Congress, because it was unconstitutional. Couldn't do it in the state legislature; unconstitutional. Where could he do it? Here, the greatest city in the world. So, yes, I'm definitely much in favor of the council’s move. This change should be done by referendum, obviously. But there is no fairness in the referendum because the same billionaire will put millions of dollars of ads on television showing the speaker of the city council in a caricature smoking cigars and raising taxes, and the city council is prohibited by charter to lobby or campaign. Gotham Gazette: But at the same time, doesn't the city council voting among itself to overturn something the voters chose through referendum twice undermine the idea that the public can participate in the political process? Peter Vallone: That's a very valid point, but the only way that that point succeeds is if the city council or someone had the opportunity to get to the public and tell them the other side of the story. So while it should be done by a referendum, it can't be done by a referendum unless you have some good government group that is willing to match the amount of money that's being spent to buy television time. Gotham Gazette: So what you're saying is that the people of New York, the voters of New York, cannot be trusted to see through a television commercial and vote what's the best thing for the city? Peter Vallone: Not that they can't be trusted, but that they don’t have the ability to see both sides of the story. Gotham Gazette: But the newspaper editorials and the good government groups are coming out opposed to the proposals on term limits. Their focus is on the process. They’re not talking about whether term limits is good or bad, they say the voters have voted for it twice in referendum, and to repeal it or to extend it, it should be referendum instead of legislature. Peter Vallone: They're saying it because it's the easiest thing to say. It's the popular thing to do. And I don’t think that the popular thing to do is the right thing to do in every case. And the right thing to do for the city is to give council members more time. Term limits should be abolished all together. Real term limits means vote the bum out when he or she comes up for office. They don't have to serve for eight years. Throw them out in four years if they aren't doing their job. You're taking away the choice of the people to keep someone good in office. If they choose to keep someone, why deprive them of that choice? It’s unconstitutional. If you're really going to have term limits, pass a constitutional amendment. Bob Zane: Question for the speaker: You made a strong case against term limits. Do you feel the same way about a mayor having term limits? Peter Vallone: No, there needs to be a balance of power. So whether it's the president, (who does have term limits), or the mayor (who does as well), or the governor, (who doesn't), the mere fact that you are a chief executive gives you enormous power. The whole idea is to check that power, so you don't have a dictator. If they stay in power too long, it's almost impossible to compete with them in anything. I think term limits for the executive branch of government is a reasonable thing to have. I'm not saying you should have it; I just don't have any beef against it. By contrast, no individual legislator has power to change policy unless he or she comes together with a majority of that legislature, and has a speaker who can speak for the majority, and get the executive to negotiate. What's going to happen with the council with term limits is that each speaker is going to be weaker and weaker. The mayor is going to be doing business with 51 council members and he or she is going to regret this until his or her dying day. There are going to be 51 people walking into the office saying I won't vote for this unless you give me this or that. And it's just going to get worse and worse as time goes on. Gotham Gazette: You say that terms limits were a disaster. To twist that, are you saying that the city council has been a disaster? What is your assessment of Miller's council? Peter Vallone: No, because you have close to 40 council members that still have another term to serve. They’re all gone in the next term. Gotham Gazette: What's your assessment of the last four years? Peter Vallone: I think they did a great job, as good a job as they could do under the circumstances because they still had experienced legislators there. But now what happens, is from the moment of that the speaker is elected, he or she is a lame duck. They're already looking to see who the next person is going to be. Gotham Gazette: Wouldn't that be true with Miller as well? Peter Vallone: No, because Miller served with me. He was a council member with me. People knew him, and he had a record. I supported him because he was bright and honest. What the county leaders were going to try to do was put another fellow in office who is now in jail. He got a six-year term. You know who you work with, you know who you deal with, you know who's honest, you know who might be shady. That's how legislators come together. HAS THE COUNCIL BECOME A COUNTERWEIGHT TO THE MAYOR? Gotham Gazette: A lot of your book is about how the elimination of the Board of Estimate in 1989 changed city government. What was the board, and what happened when it was eliminated? Peter Vallone: Prior to the 1989 charter change, you had an all powerful mayor and board of estimate. It was just a group of executives, not legislators. The board of estimate was made up of the mayor, the president of the city council, which would be equivalent to a vice mayor or a vice president on the federal level, the comptroller, who counts the money and monitors the money, and the five presidents of the boroughs. All are executive positions, and the city council could not move one penny of the budget without their permission. Under this system, the borough president of Staten Island, representing less than 400,000 people, had the same say as the president of Brooklyn, who represented 2.5 million people. It was a terrible situation. It led not only to corruption in personal activities, but corruption in government itself. It relegated the city council to a group that did nothing except follow whatever the heck the mayor wanted to. [When the Board of Estimate was eliminated in 1989], what happened to the city of New York? The first thing that happened is that the city council put into effect, with a lot of hard work, the Safe City Safe Streets initiative, which tremendously changed the whole outlook of the City of New York. Instead of people running around in gangs killing people on the subway, we were able to negotiate and bring about this new measure. We changed the policy of the homeless. Instead of huge shelters just warehousing people, we came up with transitional ways of getting people into permanent housing. We came up with campaign financing, which said that you don’t have to be a billionaire to run for mayor of the City of New York, or to become a council member. We had the power for the first time that Congress of the United States had and that any state legislature has. Gotham Gazette: You said that the elimination of the Board of Estimate finally made the council a legitimate counterweight to the mayor. That was about 16 years ago. I think it would be fair to say that some people still don’t seem to see the council as a counterweight. Why do you think that is? Peter Vallone: Well, because they don’t get the press and publicity that the mayor does. The mayor will have a press conference every single day and announce whatever he thinks is going right or wrong. The speaker of the city council, before he or she derives the ability to speak for the entire council, has to speak to the entire council and has to draw a consensus. This is fine; that's the way it should be. But it takes time and discipline, and it takes argument and it takes discussion. In addition, if the speaker of the city council does have a press conference, maybe one or two people will show up to listen to him. So there is a complete lack of fairness and balance. PUBLIC ADVOCATE AND BOROUGH PRESIDENTS: WHAT’S THE POINT? Gotham Gazette: One of the things we do at Gotham Gazette is Searchlight on the City Council. We started it before there was a Web, in 1989, in acknowledgment of the strengthening of the city council. But when the government changed it changed other things also. There has been a lot of talk in the last couple of years in particular questioning the creation of the public advocate and the retention of the borough presidents. Are there things in this new form of city government that you wish had been done differently? Has it worked out? Peter Vallone: Let me address the public advocate. I did my hardest to try and convince the charter commission to do away with that office, not all together, but to change it, call it the vice mayor, so they run on the same ticket so you don’t have two people that could be poles apart in terms of policy. There was no necessity for public advocate because each of the council members, all 51 council members can be advocates for their own district. So I think the public advocate is an office whose time is over and could be abolished. Mayor Giuliani tried to do so, but he did it the wrong way. He hated Mark Green [who was public advocate at the time]. He was going against Mark Green and I said “I can't do that. You're making this personal”. I said I would support you if you made it just for the public advocate but I don’t have any beef against Mark Green. Gotham Gazette: What about the borough presidents? Peter Vallone: Borough presidents, I think, have a role. When people wanted to abolish it, I said no. They shape 5 percent of the expense budget in their own district and 5 percent of the capital budget. When the mayor proposes his or her budget, the borough president can change it. Also, the City of New York is so big that, in my mind, each of the boroughs should be states, so that New York would have a lot more influence in Washington then it does now. There's an argument, I think for breaking up the State of New York, at least into two states. That could be done. My son, the chair of the public safety committee, has introduced a study group to talk about secession. They say that will never happen in this state. Yes it would; everybody upstate hates us, they think the City of New York is draining all of their money out. They don't realize that we've given billions of dollars. When I was campaigning [for governor] up in Buffalo, it was like campaigning in Kentucky. When I went to Plattsburgh, New York, I'm talking to Canadians. They all hate New York City, thinking that all we do is draw money away from them. So, I think they would vote for this and we'd have an opportunity perhaps to convince Congress to give us at least two states instead of one state. Gotham Gazette: But if New York City seceded from New York State who would get the name? Peter Vallone: Well that becomes â€“ well, we could give them the name. Or it would be the State of New York and the City of New York. We could go that way. It could be North and South. Like North Dakota, South Dakota: it could be North New York, South New York. Whatever the heck they want. It’s like when my favorite senator, Patrick Moynihan, had a bridge called the Hellgate bridge, the longest railroad bridge in the world, that hadn’t been painted or fixed since it was put up in 1916. So, when Pat Moynihan became chair of the finance committee, I went and I said, “Pat, we gotta do something about this. This is federally owned!” So we got $55 million to repair and paint the bridge, but then he said—and he only had three months left in office— “Let’s have a contest as to what color.” And I said, “Please, Pat, no more contests; let’s do this.” And he said, “Well, what color?” and I said “Whatever color you want is perfectly all right.” So he gets a train and we start on the middle of the bridge, and he comes out with this color. I had never seen this color. He said, “Do you like it?” I said, “I love it. It’s a great color. Let’s get it done while you’re in office.” Because you know what happens in Washington: things disappear. So, he named the color, Hellgate Red. The damn thing is deteriorating now, and we don’t have the kind of strength in Washington anymore to find out why it was such a bad paint job. But anyway, that's the story of how you get things done in Washington, and that’s why it's so important to have seniority again. Could you imagine if you had term limits, and Pat Moynihan was gone in two terms? We never would’ve gotten half of the things that we need to get from Washington, that we’re still not getting. But at least we get something, because we have someone like Charlie Rangel, who’s a step away from a very powerful position in Congress, if the Democrats take over. It’s all seniority. And that’s how you get fairness. I’m not talking about taking advantage of anybody. I’m just saying, New York City, and New York State, should get a fair deal. Dorie Peters: Mr. Vallone, given the obvious bias against New York City by the upstaters, I was puzzled why Sheldon Silver seemed to be against your campaign for governor. Peter Vallone: He didn’t seem to be, he was very much against my campaign. I have never stopped criticizing the state from the moment I was elected because of the inequities that existed. Politics is a great vehicle to get you into office, but it should not be the end. Well, Albany -— which now has the distinction of being the worst state legislature in the whole country, all right -— has just the opposite. Instead of using politics to get you into government to do the right thing for all people -— good government -— they use government to get you into politics to do the right thing for the party. And I use as the greatest example of wrong-headedness something Sheldon Silver did because of one solitary, little election in Rockland County for state senate. Two months before 9/11, Mayor Giuliani and I find out that Joe Bruno has decided to repeal the commuter use fee, which generates $600 million a year, in order to give the candidate running in Rockland County an advantage over the Democratic candidate. And, it just sailed right through. Two months later, 3,000 people are killed, and hundreds of thousand of jobs disappear. Hundred of millions of dollars are taken out of the city’s budget. No other city in the world could have survived this kind of economic disaster, no less the incomprehensible disaster of the loss of human life. You know, when there was a disaster in San Fransisco, an earthquake, no one had to ask the governor or the California legislature to do anything. On their own they passed a special assessment and got billions of dollars to help restore and rebuild San Francisco. We haven’t gotten a penny. Not a penny, and I think that’s an outrage. I don’t have anything personal against Shelly, or Joe, or any of them. But I do think that you have to throw light on what’s going wrong. You’d think that Albany was in Siberia; nobody seems to care what goes on in Albany. But if you burp in City Hall, it becomes a major story the next day. You would think that Gifford Miller was a murderer, because somebody on the staff said they only spent X amount of thousands of dollars, instead of millions of dollars, for citywide mailing. It was a story repeated over and over again, every day. Gotham Gazette: So, your alternative to term limits is a stronger campaign finance system? Peter Vallone: Absolutely. I put that into effect back in 1987 because we recognized then that there should be a balance and we were the first legislature in the land to do it. Gotham Gazette: Do you think it works well now? Peter Vallone: No, because the staff members of the campaign finance board are very idealistic, nice, young people who think that the enemy is the elected official. We should not punish people for making innocent mistakes. Also, the city council just passed a law overruling the Campaign Finance Board because they wanted to prohibit unions from giving money. You have an organization like District Council 37, which is an amalgamation of maybe 40 different unions, so that they don’t have the same popularity that police have, teachers have, or sanitation officers have. These are librarians that might only have 200 in the whole city. By themselves they really don’t have any power, but they came together with other social service groups and formed something that has been very effective in giving them a voice where they didn’t have a voice before. We were the lowest paid librarians, for example, in the entire country and the council changed that. Now, say District Council 37 gives you the maximum contribution, but the librarians also want to give a contribution; that's what's been going on, each of the separate unions give small contributions. The Campaign Finance Board comes along and says, nope if you're a member of the bigger union you can't give a contribution, only the union can give a contribution. It's just not right. That is union busting. Gotham Gazette: You mentioned that one of the reasons you wrote this book was as a guide for people who are considering running for office. In the book, you detail the system that first helped you get into public service, which was the Democratic clubhouse system. The Democrats have now lost four consecutive mayoral elections and there's not much talk about the strengths of the party at the moment. Do you think that the clubhouse system's time has come and gone? Peter Vallone: Well, it depends on what you mean by clubhouse system. I don’t think the party system has come and gone. I think the only way an average person can get elected is to form a group of people who support that candidacy, and to have volunteers rather than paid people. That becomes a political party. Nonpartisan elections are another thing that people are in favor of because it sounds nice. But by taking away the political parties, non-partisan elections just turn the system over to whoever has the most money. Parties mean that candidates have a lot of people who are going to help get signatures, petitions, all that kind of stuff, without paying them. If I'm a billionaire, I don't need a party. I will hire thousands of people to work for me. That becomes my party. How are you going to compete against that unless you have an existing organization that's going to know how to get a signature, how to go house-to-house, how to go to the Board of Elections and so on. Gotham Gazette: So, do you think it's easier or harder for a political newcomer to run for office in New York now than when you first ran? Peter Vallone: It's easier to challenge an incumbent today, much easier. That's why incumbents don't pass campaign finance. Gotham Gazette: To go back to the city government, Mr. Vallone, you served as council speaker with three different mayors. You referred to Ed Koch as the spirit of the city. You referred to David Dinkins as the heart of the city. And you referred to Guiliani as the brain of the city. Do you have a name for Bloomberg? Mayor Bloomberg at that time had total inexperience, so he believed them. And a year later, we got nothing. Now, he has the experience. He knows what he's dealing with upstate, and that's why I supported him this time, because now I know he's going to go after them, and I'll be right there alongside of him. If I don’t have the power to do anything about it, at least I have a voice to speak. Gotham Gazette: So what would be your one word name for him? Peter Vallone: I was trying to think about that. He's a good manager, very competent. And he now has that necessary experience to know what you're dealing with when you're dealing with the state and when you're dealing with the federal government. He knows that you have to strike when you can, and when you realize your power while you have it. Book Club Member: The next governor looks as though it well may be Elliot Spitzer. Do you think with him in office the city would get a greater or more of a fair share? Peter Vallone: I certainly hope so. I think there's a much better chance to have someone like Eliot Spitzer, someone who's familiar with the city, as governor. And I think he has a good record of not worrying about the big companies coming after him because he exposes corruption. The more fearless you are, the better off you are in terms of doing the right thing. That is what my book is all about. Just do the right thing and don’t worry about the consequences. In the end, the people will support you. Gotham Gazette:What do you think the big stories will be in New York City in 2006? Peter Vallone: Well, unfortunately, I think term limits is going to be a big story. If the council passes, and I hope they do, a measure to extend the limit to 12 years, for sure there's going to be a referendum put on the ballot to reverse it. And there will be a lot of very bad publicity for the council members, which will result in their being afraid to do anything. And they may not even be able to pass the term limits bill for fear of reprisal. It's just going to be a continual knock on the city council, which really doesn’t deserve it. I think that they deserve a lot of credit for changing the policy of the city and making it a better place to live. And unfortunately, there doesn’t seem to be any way of communicating with the electorate the truth of what's going on. And the big story in 2006 is probably going to be "Let’s kick around the city council." Gotham Gazette: Any other predictions? Peter Vallone: I think you're going to find a mayor who's going to take on the state legislature, and that’s my hope and my wish, And I think he has learned how to deal with the governor and is going to be very forceful and I hope he goes back to the spirit of the city, Ed Koch, who threatened to run against Shelly Silver. You need a mayor that's really going to go out and do it. And I think that could be a wonderful story.